Light: Breaking through barriers. Moving forward with confidence and authority. Reaching the pinnacle of success. Basking in the glory of achievement. Guiding an effort to total victory. Establishing yourself as a worthy leader. Shadow: Resting on laurels. Riding roughshod over the feelings or expectations of others. Focusing more on past successes than future opportunities. Failing to rein in impulsive behavior. Mythical/Spiritual: Odysseus. Jason. The search for the Holy Grail. Christ’s triumphal entry into Jerusalem. Story: With an eye toward solving the story’s central problem, the main character commits to a quest, usually at the end of the first act. Relationships. Moving forward to mutual victory requires trust and cooperation. If you have this already, depend on it during an upcoming challenge. If you lack it, consider what choices have prevented forming this kind of bond. Don’t rest on your laurels; successful romance is an ongoing commitment. Work. What do you need to move forward? Now is the time to summon resources and plan for future success. Past successes might not be an indicator of current value. Remember that employers tend to ask “What have you done for me lately?” Work accordingly. Spirituality. Celebrate spiritual achievement, but be aware that a sense of having arrived can be the first step toward disastrous vanity. The goal is not to be a guru, but to achieve balance and stability. As you make progress, extend a helping hand to others who still await their chariot moment. Personal Growth. Reaching a new plane of maturity is exciting, so some celebration is in order. Every ending, though, is a new beginning; keep an eye fixed on further growth. Having reached the limits of mundane success, it’s time to work on deeper transformation. Fortune Telling. Victory is a certainty. Move ahead with all plans. Beware the jealousy of others. The canopy. Stars imprinted on the canopy of the Chariot signify the occupant’s mastery over all things under heaven. How has past success (or a lack of it) played into this situation? The sphinxes. Horses draw the Marseilles Chariot, but in other decks, sphinxes—keepers of riddles, wisdom, and hidden knowledge—pull the carriage. One is black and the other white, symbolizing the charioteer’s dominion over masculine and feminine forces. Who guards the answer to your riddle? The scepter. The wand, a symbol of power used throughout the deck, appears in RWS-inspired decks as the charioteer’s scepter. How should you channel your power today? Achievement vs. momentum. 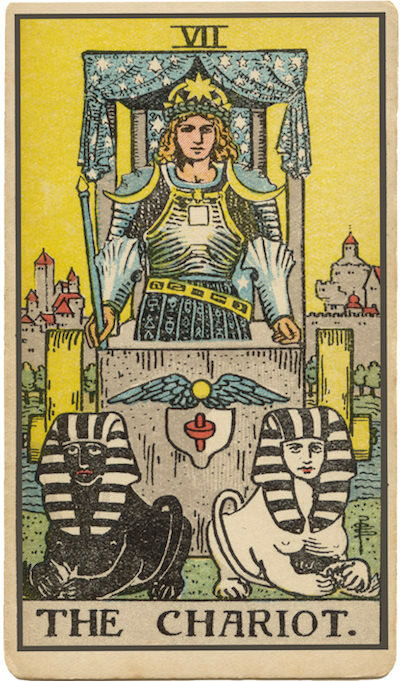 In some decks, the illustration makes it difficult to tell whether the Chariot is standing still (having reached a strategic position) or moving forward (as if mounting an attack). Is it time for strategic thinking … or action? The Lingam-Yoni. The lingam is a cylindrical or phallic shape associated with male sexual potency; the yoni, shaped like a bowl, is considered the source of all that exists. How might your situation change if you commanded unlimited creative energy? To what extent have I arrived? What will my next challenge be? How can I use past achievements to their best advantage? What would the criteria for real and meaningful success be?